Hooded seals roam the north Atlantic ocean leading normal seal lives, diving for fish, sleeping on ice, and inflating their red nasal sacs to the size of a basketball. 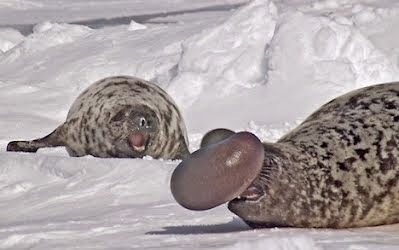 The male hooded seals are famous for their unique nasal adaptation display that they use during male-male competition for the lady seals. They have an elastic nasal cavity located on the top of their heads that is commonly referred to as the hood, which can be inflated when the seal feels threatened. The size of your hood is a big deal in the seal world, the bigger the hood the healthier and more superior the seal. When males start sizing each other up during mating season they use their nasal hoods to determine who is the biggest and baddest and funniest-looking. In our world it's common to get balloons but not see them coming out of your boyfriend's face. 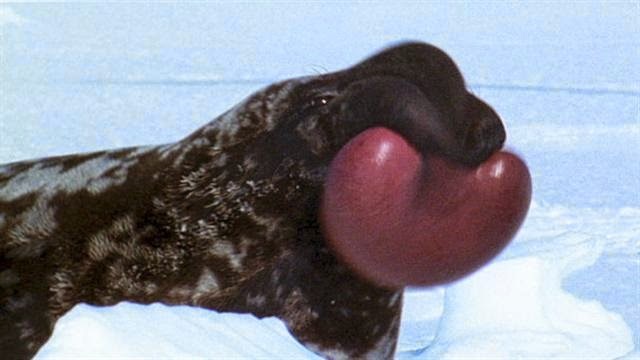 But to lady seals the nasal balloon is a major turn-on. This nose balloon, when shaken, is also able to produce calls and noises, which the males use to further excite their lady friends. Witmer, Lawrence (2001). "A nose for all reasons". Natural History 110(5): 65. If you like making fun of animals with dumb anatomy, you should probably follow us on Facebook, Twitter, Google + or Instagram. Cuz we do that a lot.